Zenith was fun to create and I did take a few liberties with its construction. Those rectangles were supposed to be two squares sewn together, but my theory is why make a seam when it is unnecessary? I also changed up some of the colour placements, but then, I'm allowed, since it is my block! Half square triangles are plentiful and this block also includes my favourite patch -- the flying geese unit. Oops, I almost forgot to mention the centre patch is made using the square in the square patch. I also included this block in the pinwheels category because, depending on the block layout, they may emerge as a secondary pattern, which is always fun. 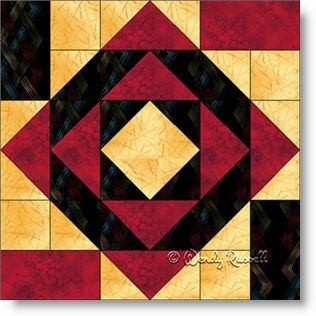 There is nothing difficult in constructing this quilt block and you can make some really interesting quilts by adding sashing and/or setting the blocks on point. The discovery is awaiting you.